I meet Ikuko in front of the glass structure in the main hall of Sendai station. 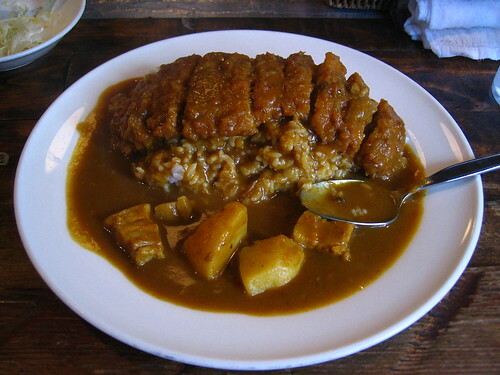 It is 7:30 in the evening, which means we’re both hungry, even myself in spite of the savory katsu kare (Japanese curry with a fried pork cutlet) I had for lunch in Shizuoka. 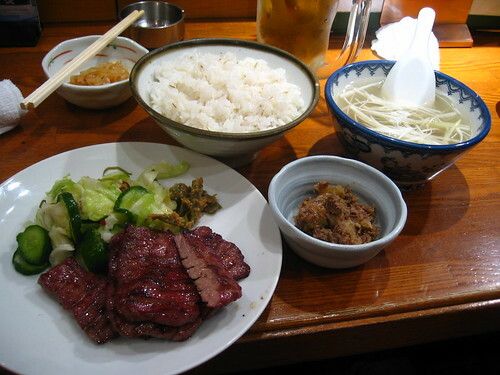 Because we’re in Sendai, we of course decide to go for some gyutan (beef tongue), the local specialty. Maybe it is just my imagination, but the whole city softly smells of gyutan to me. Granted, the restaurants abound, like in any Japanese city. Ikuko picks her favorite, which turns out to be excellent indeed. The next day I have lunch with my German hostel roommate. As I don’t have much time, we settle for sushi. The best analog way to locate the nearest kaitenzushi (conveyor-belt sushi) is to ask an old person on the street. The one we’re pointed to, hidden behind the corner of a back alley, is less than a minute away. Some minutes and about ten plates later, lunch has been taken care of. The rest of the day is mostly spent hanging out in music stores and cafés with Ikuko and a friend of hers, since I already visited Sendai a year earlier. Finally, I go for dinner alone at the local branch of Otoya, a chain that serves traditional “home-like” menus, which Robin recommended on his blog. I order a menu with slices of roasted chicken breast in a teriyaki-like sauce, salad, miso soup, rice, the usual tsukemono, all for just 730 yen, plus 100 yen more for a side bowl of cold tofu, actually the largest block of tofu I’ve ever seen. Water and green tea come for free naturally. Altogether a simple but great meal. I’ve hardly ever been in an empty restaurant in Japan. There is always people eating out at all hours of the day, in all possible social configurations: alone, in couples, groups of people, teams of salarymen. Unless they live in a family household, you don’t hear Japanese talk about cooking at home much. It might find its explanation in the low cost of eating out, the late hours many people work everyday, the long commutes back home, or the little spare time available to shop and cook during the week. Or it might just be a question of a convenient social organization, in which each person focuses on his own role, thus resulting in a tightly interdependent society, with services occupying a prominent place in the economy.